The Dodgers picked up the rubber game of their three-game series in Milwaukee, 9-2, Wednesday, largely because the Brewers couldn't pick up ground balls. The Dodgers actually did pick up ground balls and starting pitcher Hyun-jin Ryu picked up half of the outs he induced on balls that hit the ground. Dodgers right hander Hyun-jin Ryu improved to 4-2 with a 3.30 ERA Wednesday as the Dodgers won, 9-2, in Milwaukee (Keith Allison/Creative Commons Attribution-Share Alike Generic 2.0 license). The game: May 22, Dodgers at Milwaukee, National League. The Dodgers entered the game 18-26, fifth place NL West, seven games behind Arizona. Milwaukee entered the game 18-26, fifth place NL Central, 10 1/2 games behind St. Louis. 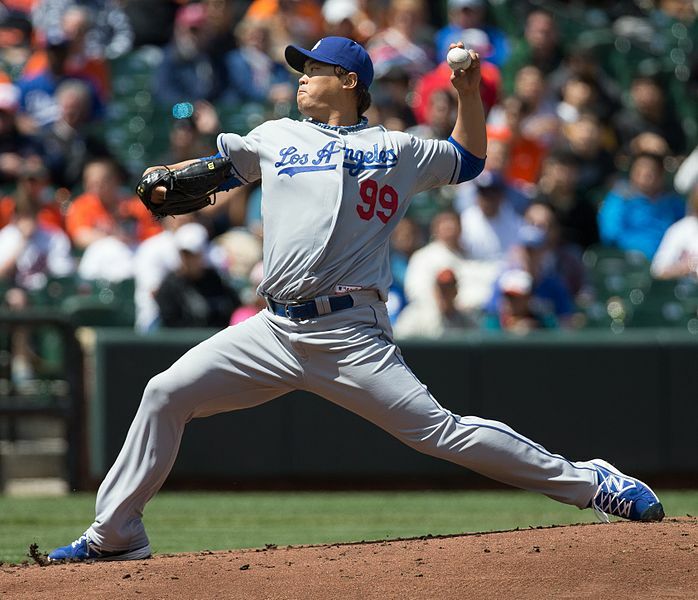 The pitchers: Dodgers, Hyun-jin Ryu, left hander (4-2, 3.42). Milwaukee, Wily Peralta, right hander (3-4, 5.94). The result: Dodgers 9, Milwaukee 2. Summary: If it's any consolation to the Dodgers, they're not the worst last-place team in this league. Their victory gave them two out of three in Milwaukee, which isn't the worst last-place team in this league, either. Fortunately for the Dodgers and Milwaukee, there's still Miami. What now: The Dodgers improved to 19-26, still fifth in the NL West, but they gained a game on first-place Arizona, which lost to Colorado, so they are six games down. Milwaukee is 18-27, fifth in the NL Central and 11 down to St. Louis, pending the Cardinals' result at San Diego later in the day ... The Dodgers return to Los Angeles to play the Cardinals in a weekend series that begins Friday. Opening up that series, the Dodgers have scheduled left hander Chris Capuano (1-2, 4.84) against St. Louis right hander Lance Lynn (6-1, 3.27). Capuano is coming off two straight quality starts, during which he allowed a combined two runs in 13 2/3 innings against Miami and Atlanta ... The Cardinals lead the NL Central and have the best record in the National League, 29-16 entering Wednesday's games ... The Dodgers are done with Milwaukee for the year, winning four of six from the Brew Crew. Milwaukee won six of seven meetings between the two clubs in 2012 ... Teams playing against the Brewers this year apparently get better against them with familiarity. The Brewers are 8-8 in the first game of a series, 8-8 in the second game, 3-10 in the third game and 0-2 in the fourth game.